The beautiful handsewn cape worn by Alisemon Hardy around 1900 is shown in front, back and closeup photographs. 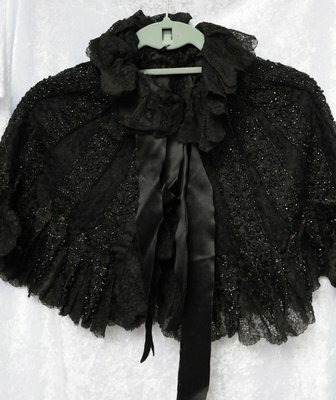 The lace covering the entire cape and forming the collar is machine-made and purchased, as are the strips of beading overlaid on the lace, and the beaded triangles around the bottom of the cape. A strong hook and eye holds it together at the neck. Front and back views of a girl's eyelet lace dress follow. The eyelet lace was purchased in the form of a wide border then cut to form the sleeves and bottom of the skirt as well as the bodice top. The dress pattern was specifically designed to use this type of lace. 3 horizontal pleats in the skirt add decoration while providing the ability to lengthen the dress as the child grew. The dress fastens up the back with hooks and eyes.